A prominent county councillor fears crime and anti-social behaviour will increase as a result of plans to ‘switch off’ thousands of street lights. Cash-strapped Lincolnshire County Council is proposing to introduce ‘part night’ lighting in many residential areas. Lights will operate until midnight but will then be switched off until morning. It will affect 38,000 street lights. Up to 3,000 street lights, away from built up areas, have been identified for a possible ‘switch off’, subject to further assessments. As part of the plans, 17,000 of the county’s 68,000 lights will be replaced with low-energy LED units which can be dimmed. The council must save £41m over the next 12 months and says the switch off will reduce spending by £1.7m. The Conservative-led authority says it will keep lights on in certain areas including zebra crossings, recognised crime h0t-spots and warden-controlled accommodation. But Coningsby’s Colin Mair, the UKIP leader at County Hall, says he is still worried about crime - and the impact on elderly people. 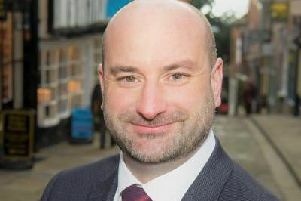 Coun Mair told the News: “I have spoken to front line police officers who are concerned that switching off street lights will lead to increased crime and antisocial behaviour. “There is a statement about sheltered housing, warden controlled accommodation and care home. There isn’t much warden controlled accommodation since most of the wardens were sacked. “Also what about areas, and there are several in my ward, where there is a concentration of vulnerable people who do not fit into the above categories. “CCTV systems might as well be switched off when the lights are off, as the images will not be any use. “A lot of communities have invested in interactive speed signs that rely on a power connection from the lamp posts. Coun Richard Davies, Executive Member for Highways, said: “We have to reduce our annual spending by £170m over the next four years which means we cannot provide services at the level we have been doing.